Rafting next to a Glacier (Photo by Bruce Kirby). To the uninitiated, glaciers are an enigma. Sprawling white masses of ice that snake through the peaks, dominating high places, shaping the land beneath, forever changing the mountain landscape – intimidating and enchanting the viewer. The phenomena first appeared a “few” (83 million) years after the earth began cooling from the Pliocene Epoch. Snow started to accumulate over the northern portions of the globe and even in mid latitudes. The reasons are debated but the results are evident even today. As the snow amassed, it exerted pressure on underlying layers. At great thicknesses the fresh snow compressed into a granular form called firn. Over time and with increased pressure, the firn welded into glacial ice. Thus was the development of the vast continental ice sheets that slowly moved over the mountain ranges of the world. This geological period of time is known as the Pleistocene Epoch of the Quarternary Period and encompasses the last 1.87 million years. Today, most glaciers we encounter are relegated to high jagged mountains of the world (and shrinking!). Every year, thousands of people from around the world set off on an Alaskan Cruise just to experience the vast icefields, cascading glaciers, and icebergs. For those of us who choose more intimate vessels, the lure of the glaciers is equally inspiring – drawing us to rivers that flow through glaciated valleys. 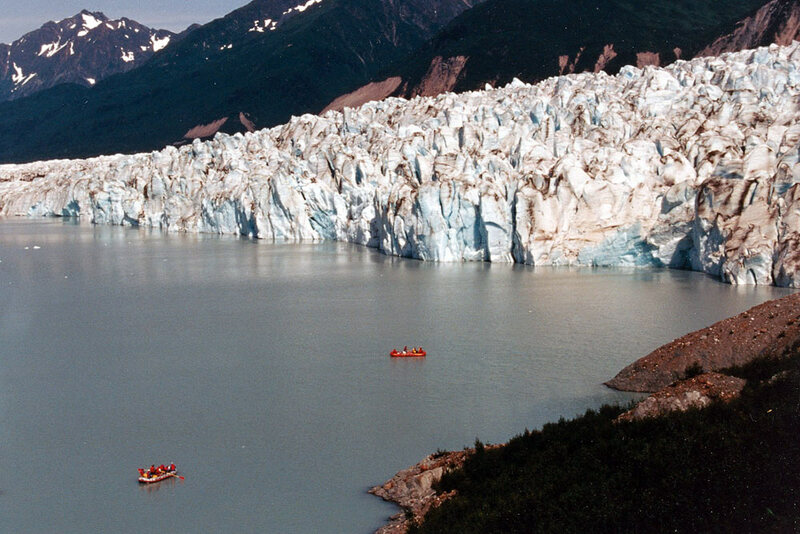 The Tatshenshini and Stikine offer breathtaking views of hundreds of glaciers. 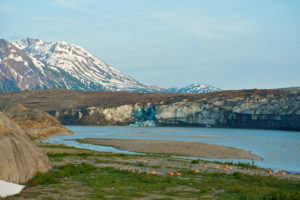 These rivers promise “up close” views of icebergs – Alsek Lake on the Tatshenshini and Great Glacier Lake on the Stikine. Here, the snouts of the glaciers end in a body of water where ice movement and fracturing causes enormous slabs of ice to fall off the face of the glacier in a noisy crescendo, plunging into the water. The resulting “berg” floats silently until melting upsets the balance, causing it to roll in an explosive action sending large rolling waves out into the lake. 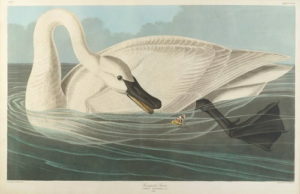 John Muir described a calving glacier as “an array of jagged spires [and] battlements, of many shades of blue, from pale shimmering, limpid tones in the crevasses and hollows, to the most startling, chilling, almost shrieking vitriol blue on the plain mural spaces from which bergs had just been discharged.” The blue colour is a result of the ice molecules reflecting blue waves of light. Virtually every mountain range has been affected by glaciers. While widening river valleys into broad “U” shapes, they create high narrow ridges called aretes, pyramidal shaped peaks termed horns, and scooped out alpine basins named cirques. The power of the ice as it flows over the mountain’s surface shapes the land over which it passes and picks up the ground material to be carried on by the glacier. Most people do not realize that the underlying stone is ground away by particulate matter in the melt water running between the ice and the ground or by rocks carried by the glacier. It is not actually “carved by the ice”. Floating on a glacial berg lake we enjoy a view akin to that of which Muir wrote: “making a picture of icy wilderness unspeakably pure and sublime”. Looking towards the glaciers, dark lines of rubble are visible running down the middles or edges. The middle ridges, medial moraines, mark the joining of two separate glaciers. Lateral moranes mark the edges where melt water from the glacier dumps the rock material it is carrying. Walker Glacier (Photo by Tyler Garnham). Glaciers are in a constant state of motion – they are either advancing or retreating. As the snow accumulates on the upper portion of the glacier it exerts pressure on the snow and ice below causing it to flow, albeit at a pace not visible to the human eye. When the rate of melting exceeds the rate of accumulating snow, the glacier retreats. The rate of retreat can be measured by noting the distance between succeeding terminal moraines (ridges of glacial deposits). 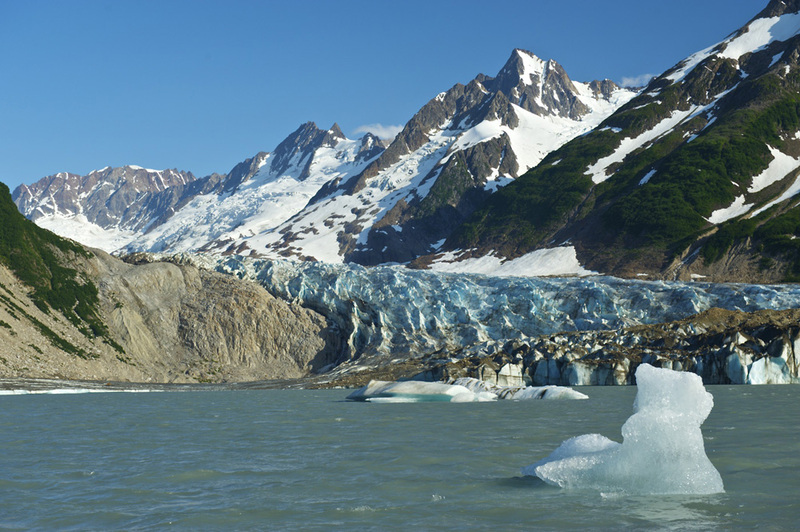 Great Glacier Lake on the Stikine River is cut off from the river by one of the Great Glacier’s terminal moraines. This moraine acts as a damn and keeps the lake from flooding into the river. If a glacier is retreating very rapidly, there is no distinct terminal moraine. Instead, there is a more general ground moraine. The Walker Glacier on the Tatshenshini provides visitors with an opportunity to hike on it’s surface. Much of this glacier is an interrupted array of jagged ice known as an icefall. Here the underlying ground is too steep for the overriding ice to flow smoothly. The stresses forced on the upper ice are so great, the ice opens up into a series of crevasses that form the steps of the icefall. These deep slots deserve great respect from the traveller. Perhaps the most significant fact is that glaciers not only provide sheer overwhelming beauty… They are also a great source of ice for pre-dinner drinks (on heavily traveled glaciers beware of ecoli)! This article was originally published in the fall 1994 issue of our Northern Currents newsletter.